There is good news for vegan bread lovers; many breads are naturally vegan. Despite the surplus of naturally vegan breads, it is always beneficial to use a keen eye and inspect the ingredient list for non-vegan ingredients. Additionally, when purchasing bread, vegan individuals can keep it simple and purchase certified vegan breads to ensure there are no hidden animal-based ingredients in their bread. Other grains added such as oats, barley, rice, etc. All the ingredients above qualify as vegan ingredients. This makes many breads safe to eat if following a vegan diet. However, some breads add additional ingredients for flavor or to serve as a filler. If searching for vegan bread, also keep an eye out for the following ingredients as they do not qualify as vegan. These can commonly be found in many bread brands on grocery store shelves. However, if buying freshly baked bread these ingredients are used much less frequently. Although these ingredients can add a lot of flavor to bread, they are made from animals and don't meet vegan standards. Bloomfield Farms Vegan Sandwich Bread - Bloomfield Farms is a fully gluten-free company that also makes vegan bread. This bread is dairy-free, egg-free, soy-free, and is made from real ingredients. The company boasts their bread is "fluffy and flavorful," without any aftertaste than some gluten-free breads give off. Bloomfield Farms Vegan Sandwich Bread can be bought online for around $6.00 per loaf. 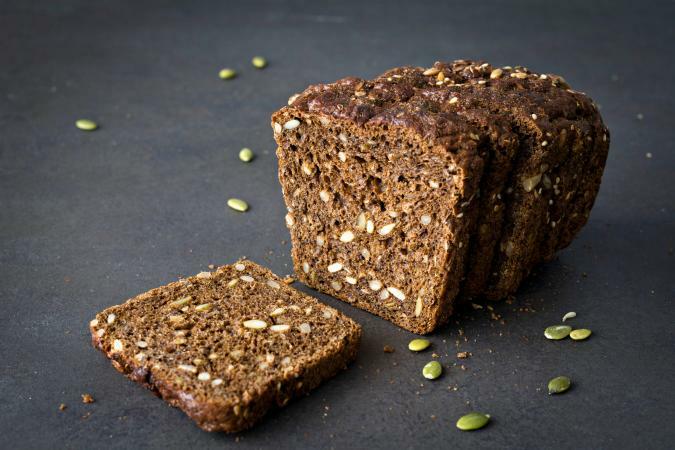 Food for Life 7-Sprouted Grains Bread - This hearty bread isn't just ideal for vegans, but everyone searching for nutrient-dense bread. The 7-Sprouted Grains Bread is vegan and contains a mixture of brown rice, barley, oats, corn, rye, millet, and whole wheat. One slice provides 80 calories, four grams of protein, three grams of fiber, and only one gram of sugar, making it an excellent bread selection for the whole family. Food for Life 7-Sprouted Grains Bread can be bought at many local retailers for around $4.00-6.00. Use their store locator tool to find bread near you. Dave's Killer Bread - This bread company is not officially "certified vegan." However, all but one of their breads are vegan and are labeled "contains no animal products" except the Honey Oats and Flax bread. Dave's Killer Bread is a fantastic bread line offering hearty, healthy breads. These breads only contain natural ingredients, are non-GMO, and USDA organic. Most are high in fiber and protein. Dave's Killer Bread can be purchased online or at a retailer near you using their store locator tool. No matter what you're shopping for, finding items that meet the vegan diet's qualifications can be challenging at times. Luckily, bread can be a simple purchase. Most breads are naturally vegan and just require a quick ingredient list check. However, fully vegan bread producers also make bread for the vegan consumer. If you ever have concerns about the bread you are purchasing speak to a registered dietitian.